High Cut-Offs Burnt by Government School Students! Government School Students Demand 80% Reservation in Government-Funded Institutes and Universities! Government School Students and their Parents Agitated over the Fact that Cheap Public Funded Education is Beyond Their Reach! An Open-Letter is also sent to HRD Ministry for Immediate Intervention! Today (June 26) a large number of government school students, their parents and progressive individuals protested against the high cut-off for admission in Delhi University. 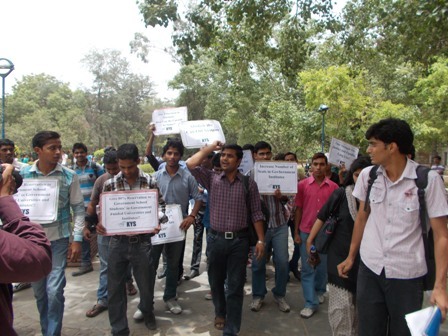 The colleges of DU declared their first cut-off for admission to various courses on Tuesday. With this the wait is formally over as far as the procedure to get oneself admitted in a college was concerned. However getting a seat secured in a college/course still remained a distant dream for many as the cut-offs have sky-rocketed beyond the expectations. However this is not something which is unique to this years’ cut-off. Every year cut-offs are so high that government school students are not able to get a seat in the institutes of higher learning. Our organization firmly believes that the cut-offis nothing but a calculated policy to keep the higher education beyond the reach of students from government schools, an overwhelming majority of whom come from socio-economically deprived backgrounds. 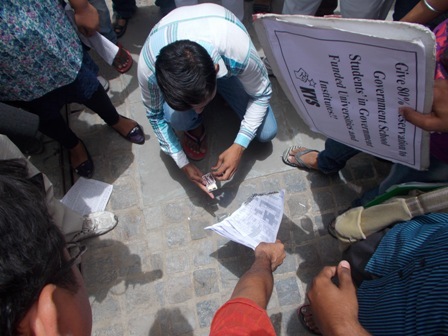 These students have also sent an open-letter to HRD Ministry for immediate intervention. It is important to note that the higher cut-offs eliminates the chances of government school students in the institutes of higher learning and the only recourse left to them is to do some technical certificate and diploma courses and become a source of cheap labour in the market. Also interesting is the fact that the government has not only continued with the dual education system but has kept the same cut-off for government and private schools.It is an undeniable fact that students from private schools with better teaching and coaching facilities get higher marks and the domain of government funded higher education becomes virtually theirs as there are a very limited number of seats. Whereas the students from government schools always have to kill their ‘ambition’ without anyone noticing the fact that the race was unequal from the start. The bad result of these government school students is a result of the larger policy issue. Most of the government schools students lack basic facilities and have insufficient number of teachers (mostly in science and commerce courses) which is magnified by their home environment as most of these students are first generation learners and mostly live in a single rented room with the entire family. The unavailability of sufficient teachers forces the students to go for unregulated tuitions which not only creates havoc of their career but promotes the privatization of education. It is high time that government should undertake its responsibility of ensuring that a large section of students is not denied higher education due to loopholes in the policy. We demand an immediate enactment of a policy that provides marks relaxation/reservation to students of the government schools in the publically funded institutes of higher learning. We do understand that the reservation cannot be a permanent solution. Therefore the government must abolish the dual system of education with private schools students with all sorts of facilities getting the fruits of cheap higher education on the one hand and on the other the government school students from socio-economically deprived background and lack of good learning facilities remaining outside the domain of higher learning. We also demand that the government should increase the amount of budget spent on higher education for the children of working masses. 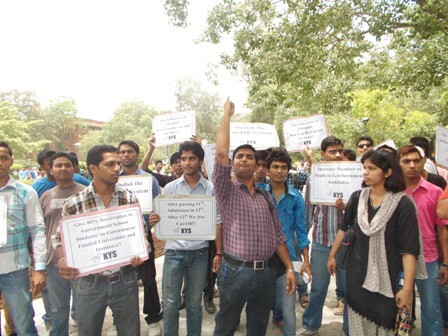 It is to be noted that in India the number of students who go for higher education are abysmally low. Only 7 percent of the students who pass 12th standard go for higher education. Even these seven percent students do not get to study the courses and colleges of their choice, and only a very small number of students from them get seats in regular colleges. Most of the students end up doing their study through correspondence or distance learning. In Delhi University there are only 54000 seats whereas 146000 have applied for admission. Thus around a lakh students will be denied admissions. It is important to note that these students are aspirants yet they will not be given admission due to less number of seats. Isn’t it ironic that even from a small number aspirants a large number is denied admission. Most of students who are denied admission are from government schools and are first generation learners. Thus denying them admission eliminates their scope for upward mobility. High cut-offs and less number of seats are problematic in many ways. For example if there are less number of seats overall, the reserve seats will be lower. Thus reservation which was a constructive policy to bring out Dalits from the villages and traditional occupations would remain an empty box as a large number of students will not get a seat. For example in Delhi University there are 12000 odd seats reserved for SC/ST candidates whereas the number of applicants are around 24000 i.e. double the number of seats. Thus a large number of students from the reserve category are forced to go back to their villages and continue with traditional occupations. This would deny not only upward mobility but also makes Dalit students prone to caste oppression and atrocities in the villages. 1. 80% reservation for government school students in public funded institutes and universities. 2. Immediate increase in number of seats in institutes of higher learning. 3. Increase in the amount of budget spent on education. 4. Abolition of the dual education system. 5. Hostel facilities for all the students from socio-economically deprived background.